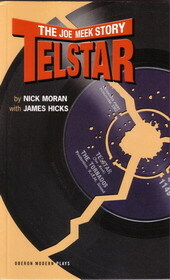 "Telstar - The Joe Meek Story"
von/by Nick Moran with James Hicks. With Con O'Neill, Linda Robson, Adam Rickitt and others. Directed by Paul Jepson. 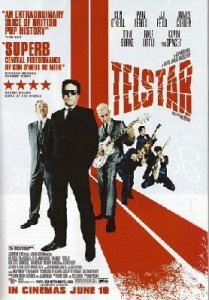 "Telstar - The Movie "
GB 2008, directed by Nick Moran; written by Nick Moran & James Hicks; cast: Con O'Neill, Kevin Spacey, Pam Ferris; 114 minutes. Der Spielfilm basiert auf dem obengenannten Bühnenstück und ist auf dem 52. London Film Festival am 25. Oktober 2008 uraufgeführt worden. Nach einiger Verzögerung ist der Film am 19. Juni 2009 in den englischen Kinos angelaufen. Eine DVD (Region 2) und ein Soundtrack-Album sind im September 2009 erschienen. The movie is based on the stage play mentioned above and received its première on October 25, 2008, at the 52th London Film Festival. After some delay the movie started on June 19, 2009 at British cinemas. A DVD (region 2) and a soundtrack album have been released in September 2009. Zwei kleine Premierenvideos / two short videos from the première hier und hier. GB 1963, Regie: Lance Comfort, Drehbuch: Lyn Fairhurst, Harold Shampan; Music Direction: Joe Meek; 75 Minuten. In the U.S. originally released under the title "Sing And Swing". mit David Hemmings, Jenny Moss, Heinz Burt, Kim Roberts, Andy Cavell, The Saints, The Outlaws u. a. Die Region-1-DVD (U.S.A.) ist vergriffen, aber möglicherweise in einigen U.S.-Shops noch zu finden; in Europa wurde im Dezember 2008 eine Region-2-DVD veröffentlicht, die nach wie vor lieferbar ist. The region-1 DVD (U.S.) is out of print but may be still available in some U.S. shops; in Europe a region-2 DVD has been released in December 2008 and is still available. In Joe Meeks Geburtsstadt Newent, Gloucestershire, findet jährlich seit 2007 das Joe-Meek-Festival statt. 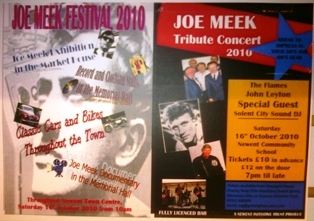 Since 2007, the city of Newent stages its annual Joe Meek Festival to honour its native son. "Joe Meek - The Telstar Man"
The exhibition has been developed in association with members of the Joe Meek Appreciation Society. 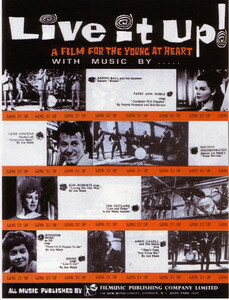 There is a wide range of material, including a clavioline used in recording 'Telstar', tape recorders adapted by Joe, a representative selection of the EPs, LPs and singles produced by Joe Meek, photographs of Meek and contemporary bands and singers, personal items belonging to Joe Meek, sheet music, acetates, scrapbooks, musical instruments and much more. You can find out about Joe, his music and go on a virtual tour of his studio in 304 Holloway Road. There is also a display featuring all sorts of household items from the 1950s and 1960s to set the scene. "The Hamburg Sound - Beatles, Beat und Große Freiheit"
Der Begriff "Hamburg-Sound" leitet sich daher ab, dass viele Bands zu Hause in Liverpool in erster Linie zunächst versuchten, den Sound der großen Hitbands zu kopieren. Erst in Hamburg fanden sie zu einem eigenen Sound, den sie dann wiederum in den Merseysound eingebracht haben. - Dies war eine liebevoll zusammengetragene Ausstellung über den "Star-Club" und die Musikszene Hamburgs in den sechziger und frühen siebziger Jahren. Darunter fand sich auch allerlei Material über und von Acts aus Joe Meeks Schmiede, dazu eine Fülle anderer zeitbezogener Materialien. Katalog und CD sind im Handel und im Museum erhältlich. The term "Hamburg Sound" goes back to the Merseybeat bands from Liverpool who at home mainly tried to copy the big hit bands. In Hamburg they were able to develop their own sound and to infuse it back into the Mersey Sound. 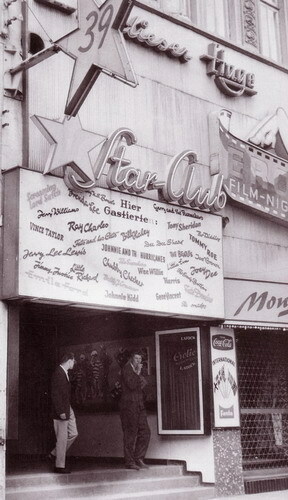 - This was an affectionately compiled exhibition on the "Star-Club" and the music scene of Hamburg in the sixties and early seventies. Among it there were some memorabilia about and from acts of Joe Meek's, a lot of other time-related material was added. Catalogue and CD are available at any book shop as well as at the museum. 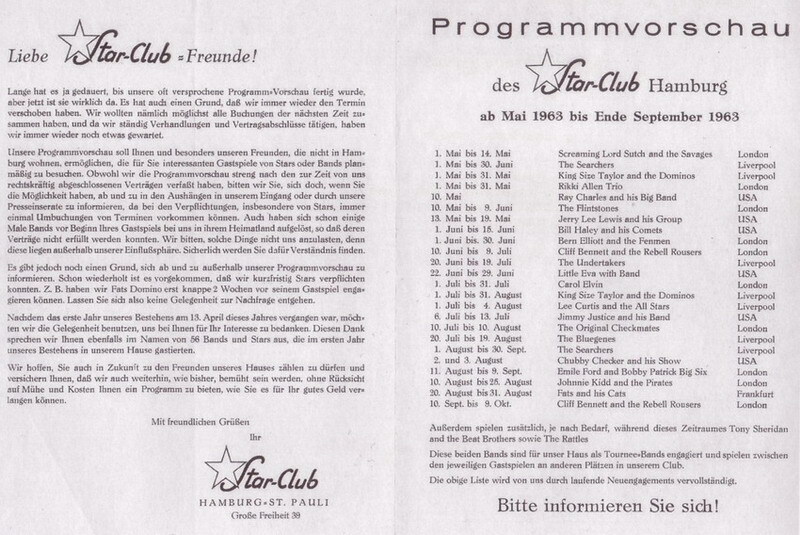 Vorder- und Rückseite einer Star-Club-Programmvorschau, Mai bis September 1963. Cliff Bennett: obere Reihe, 4. v. l.; Screaming Lord Sutch: zweite Reihe, 2. v. l.; Emile Ford: zweite Reihe, 3. v. l.
Front and back side of a Star-Club program roundup, May to September 1963. 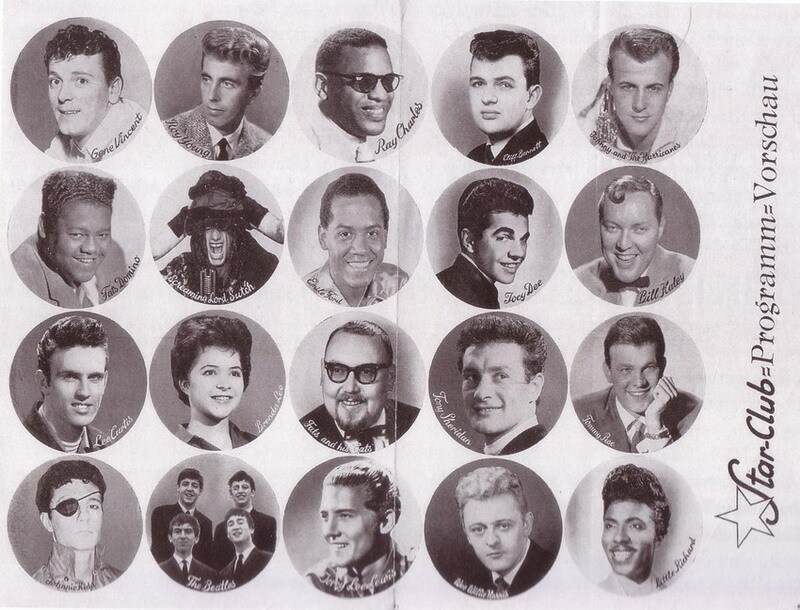 Cliff Bennett: top row, 4th from left; Screaming Lord Sutch: second row, 2nd from left; Emile Ford: second row, 3rd from left. Star-Club-Chef Manfred Weissleder und Screaming Lord Sutch in der Garderobe des Star-Clubs, 1963. 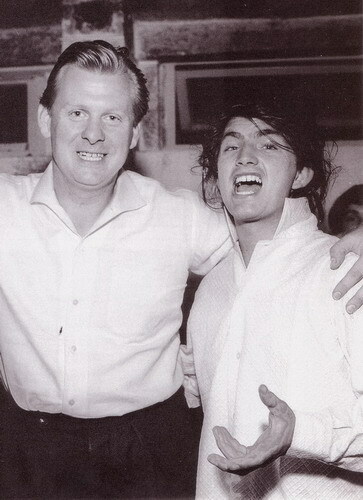 Star-Club boss Manfred Weissleder and Screaming Lord Sutch in the Star-Club dressing room, 1963.